June 28 is the 179th day of the year(180th in leap years) in the Gregorian calendar.There are 186 days remaining until the end of the year. The ISO week date system is effectively a leap week calendar system that is part of the ISO 8601 date and time standard issued by the International Organization for Standardization (ISO) since 1988 and, before that, it was defined in ISO (R) 2015 since 1971. It is used (mainly) in government and business for fiscal years, as well as in timekeeping. This was previously known as "Industrial date coding". The system specifies a week year atop the Gregorian calendar by defining a notation for ordinal weeks of the year. In number theory, a perfect number is a positive integer that is equal to the sum of its proper positive divisors, that is, the sum of its positive divisors excluding the number itself. Equivalently, a perfect number is a number that is half the sum of all of its positive divisors i.e. σ1(n) = 2n. June 6 is the 157th day of the year in the Gregorian calendar. There are 208 days remaining until the end of the year. Year 572 (DLXXII) was a leap year starting on Friday of the Julian calendar. The denomination 572 for this year has been used since the early medieval period, when the Anno Domini calendar era became the prevalent method in Europe for naming years. 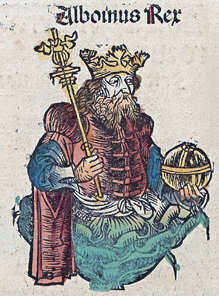 Alboin was king of the Lombards from about 560 until 572. During his reign the Lombards ended their migrations by settling in Italy, the northern part of which Alboin conquered between 569 and 572. He had a lasting effect on Italy and the Pannonian Basin; in the former his invasion marked the beginning of centuries of Lombard rule, and in the latter his defeat of the Gepids and his departure from Pannonia ended the dominance there of the Germanic peoples. Year 751 (DCCLI) was a common year starting on Friday of the Julian calendar. The denomination 751 for this year has been used since the early medieval period, when the Anno Domini calendar era became the prevalent method in Europe for naming years. Year 202 (CCII) was a common year starting on Friday of the Julian calendar. At the time, it was known as the Year of the Consulship of Severus and Antoninus. The denomination 202 for this year has been used since the early medieval period, when the Anno Domini calendar era became the prevalent method in Europe for naming years. Yuan Shao, courtesy name Benchu, was a warlord who lived in the late Eastern Han dynasty of China. He occupied the northern territories of China during the civil wars that occurred towards the end of the Han dynasty. He was also an elder half-brother of Yuan Shu, a warlord who controlled the Huai River region, though the two were not on good terms with each other. Year 548 (DXLVIII) was a leap year starting on Wednesday of the Julian calendar. The denomination 548 for this year has been used since the early medieval period, when the Anno Domini calendar era became the prevalent method in Europe for naming years. Basilides and Potamiaena were Christian martyrs now venerated as saints. Both died in Alexandria during the persecutions under Septimus Severus. Irenaeus was a Greek cleric noted for his role in guiding and expanding Christian communities in what is now the south of France and, more widely, for the development of Christian theology by combatting heresy and defining orthodoxy. Originating from Smyrna, now Izmir in Turkey, he had heard the preaching of Polycarp, who in turn was said to have heard John the Evangelist. ↑ Turnbull, Stephen (1977). The Samurai. New York: Macmillan Publishing Co., Inc. pp. 156–60. ISBN 9780026205405. ↑ "Yvonne Sylvain, médecin (1907-1989) – Haïtiennes". scienceetbiencommun.pressbooks.pub (in French). Retrieved 2018-05-30. ↑ McLellan, Dennis (June 28, 2018). "Harlan Ellison dies at 84; acclaimed science fiction writer was known for combative style". Los Angeles Times . Retrieved June 28, 2018. Wikimedia Commons has media related to June 28 .